Twain's American adventure hero, Tom Sawyer, shows his expertise at getting into dangerous situations. When he and his pal, Huck Finn, stumble on a midnight murder, Tom almost meets his match in evil Injun Joe. Joe has hidden a golden, ill-gotten treasure that Tom means to find . . . if Joe doesn't get him first! Recommended for grade 11. Back and white. 1997, Signet Classics. 4 x 7 inches. 216 pp. 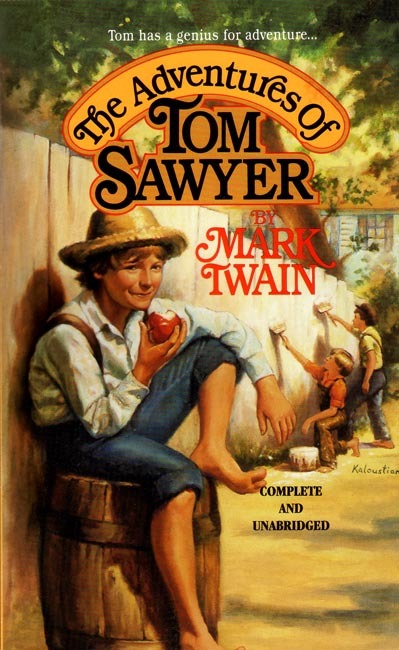 "Adventures of Tom Sawyer" is the epitome of a childrens classic! This is a wonderful book about a young boy growing up on the banks of the Mississippi river, in a small town called St. Petersburg. This book should not just be for 11th graders, but for all school children 4th grade and up! Adventures of Tom Sawyer is so awesome! The book was quick-paced, had humorous adventures! I couldn't help but love the irrepressible Tom Sawyer!